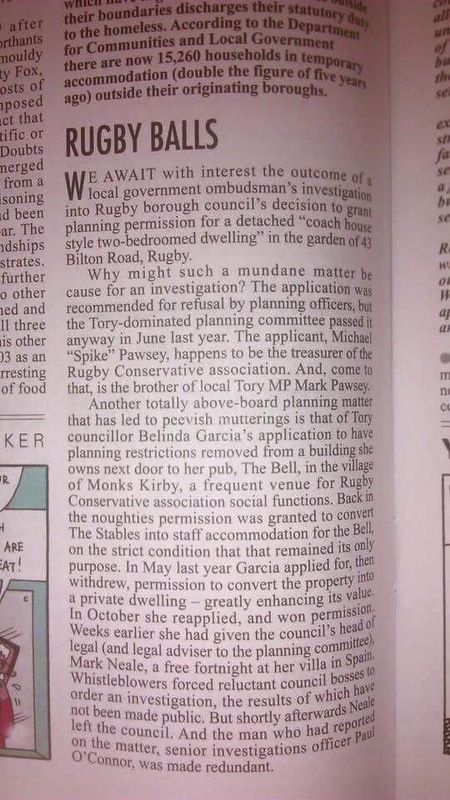 When Craig Humphrey was the leader, Private Eye often had a story about him in their “Rotten Boroughs” section. Having left for a nice sinecure in the quango sector (conveniently as a director for a body he was involved in setting up as a council leader), I was hoping our area would no longer have the shame of a PE reference. I checked the minutes of the meeting at which Belinda Garcia’s application was approved. Four Tory councillors disclosed an interest as she is a fellow councillor. But none of the others did, despite her being a Borough Councillor (and so a fellow to all of the Planning Committee, particularly the Conservative ones). The chair of the committee, Carolyn Robbins disclosed a pecuniary interest as she is also a close friend. This meant that Robbins did not vote on the item. Why did Tory councillors Jill Simpson-Vince, Tony Gillias, Graham Francis and Chris Pacey-Day not even declare an interest? And what is happening when an officer is made redundant after reporting what appears to be “gifting” to an officer? The proposed dwelling would be located to the rear of no.43, Bilton Road and would form a ‘backland’ development. Having regard to the isolated positioning of the development amongst the residential gardens which characterise this area, the proposed dwelling is considered, by virtue of its siting, to be unsympathetic to the character and appearance of the locality. Furthermore the development due to its location, size and height would form an unneighbourly form of development impacting in terms of an overbearing and an overshadowing impact upon the neighbouring rear gardens to the detriment of the amenities currently enjoyed within. The proposal is therefore considered contrary to policy CS16 of the Rugby Borough Core Strategy 2011. Councillor Tony Gillias moved, and Councillor Helen Walton seconded, that both reasons should be set aside and the application approved, and so it was. I have asked the Tories and RBC for comment. This is to be spread over 270 projects, resulting in up to 22,400 new houses. However, it appears that most are already planned developments that have stalled. The programme is called ‘Kickstart’, and this is just the first phase. I have to say that I am in favour of support of housing at the current time. Yes, market demand is down and prices are low compared to recent years, but the fact remains that we have a general housing shortage in the UK, which is getting acute in some areas. The fixation with home-ownership has meant that the rented sector has been ignored. Private renting has been dominated by the buy-to-let market, which is under serious pressure as the equity behind the mortgages has been squeezed, and while interest rates are lower, the chances of tenants needing to move has increased the risks to landlords. I’ve always felt that tenants get a raw deal in this area anyway, with rapacious agents charging 10-15% for ‘management fees’ and doing little, while also charging for every thing they do on top (inventory checks, credit checks, drawing up a contract, etc etc), but of course they don’t charge ‘key money’ because that’s illegal. Public rented housing has declined markedly over the past 30 years. As successive governments have promoted the right to buy, they have also forced councils to give away large discounts, and for a long time, also made sure that councils did not have the ability to replace stock. The Housing Associations – now called ‘Registered Social Landlords’ (RSLs) have been pushed into try and fill the gap, but they are largely undercapitalised and rely in large part on grants and favourable land deals (from councils in many cases) to build a modest number of properties each year. That’s why, despite a slump in prices, the average house is worth about 6-8 times the average salary (the vagueness is because the definition of ‘average’ depends on which survey you look at, and house prices are not easy to accurately measure at times of low market activity). Most mortgages are limited to about 3-4 times annual salary – for good reason – and so you can see that people need to have a fair amount saved or in equity to be able to buy at present. This suggests (based on simple market theory) that demand is still high, and comparisons over history suggest that is the case. Now, were I a free-market capitalist, right now I’d be suggesting that the market will correct this situation, and as if by magic, all will be well. Problem is that this doesn’t appear to have been the case over the past few decades of increasing private involvement in housing – if anything, the recent slump demonstrates that while the private sector can boost prices for owners and then create a self-destructive bubble, it cannot do much for people at the lower end of the market who get priced out of buying and get fleeced when renting. So, instead, I believe that it is right for the government to stimulate the housing market by putting money (whether grants or loans) in to ensure that homes are available to buy or rent more easily, and hopefully at more reasonable prices. That they should have been doing this over the past 12 years, instead of simply producing targets for development that don’t go very far, is by-the-by. I can’t change the past, and neither can the government. That the likely next government will do less for housing is to me almost a given (the Tories seem to have a visceral hatred of social housing, where with New Labour it was just something that they didn’t understand, not having come from the background that many previous Labour politicians did). So we might as well welcome what we get when we can get it. However, 22,400 houses is not going to solve the real problems we face. Check any local council that has a housing register. I believe many will have over 1,000 people on waiting lists, with a fair number of those homeless. There are far more people in what’s called the ‘hidden homeless’ – people who are living with parents or others because they can’t afford to move out into their own place, even though they really want to, and can’t qualify for assistance because they are working and have a ‘low housing need’. In the 1950s and 1960s, the UK were building about 150,000 houses a year – and that was just the social housing. Now the target is 150,000 in the next decade. While there are people who are going to be against more housing, especially when it is planned for near where they live (especially social housing, because we can’t have the proles living near ‘nice’ people, can we? ), the reality is that if we don’t built more than we are – more than we are even planning to – and if much of that new capacity is not for affordable renting (which tends to mean council or RSL), then we are going to be storing up problems for the future. On the Rugby Observer website there is an article that appears to have come a bit late to get into the latest print edition: Last chance to have your say. What it concerns is the ‘Core Strategy’ for Rugby Borough. This is essentially about planning and development around the Borough over the next twenty years, and is part of the process of replacing the current ‘Local Plan’. vision for the future of Rugby Borough to 2026. Strategic allocations for housing and employment development up to 2026. A Development Strategy for the Borough. Planning policies which will be used to determine planning applications when the Core Strategy is adopted. Proposal Maps showing sites for particular land uses and displaying relevant policies by identifying areas of protection, such as Green Belt and conservation areas. The public has until 21 August to comment. Anything received after this date will not be considered, as the consultation period is fixed by law. I haven’t really had time to go through it yet, and I can’t say that I know the area all that well so I may not be aware of all possible issues or the history of particular bits of land, but I’ll try to have a go. For a paper copy, call the council on 01788 533762, or email forward.planning@rugby.gov.uk. The means of sending comments is explained there. You can’t just do so by dropping them a line, a particular form is required and specific criteria must be in place as grounds for objection, as this is the draft submission – the overall process has involved public consultation in periods over the past couple of years.